The Easycorder is Maycom’s second generation of professional portable solid State recorders, and has proven itself time and time again in the most harsh environments in the world - war zones, storms, political demonstrations, deserts, jungles and more. In short, the Easycorder is made for conditions under which other solid state sound recorders would probably fail. Loved by professional users for its ruggedness, versatility and reliability, the Easycorder is, in effect, the complete recording studio and editor all-in-one. A unique toolkit for the sound recordist on a mission! Using state-of-the-art electronics in its mic preamps, limiter, AD and DA converters recordings are of quite outstanding audio quality. 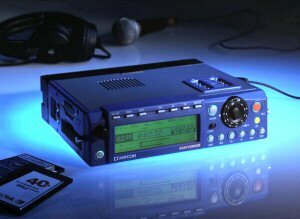 A large illuminated LCD, positive control buttons with both mechanical and electronic lock during recording, large ganged/locked gain level adjustment and a preset system form an easy-to-operate user interface. Due a a wide range of supported audio and file formats the Easycorder integrates seamlessly with all major broadcast automation systems, enabling you to get your scoop on the air as fast as possible. In short, the battle-proven Easycorder is the ideal reporter’s toolkit for achieving the best recordings under the worst conditions, and then delivering the material from anywhere to anywhere in the world, in the easiest way! Time shift recording loops your recording in a 20-second buffer until you really start the recording. This means you will never accidentally miss that revealing remark at the start of your interview! Smart Space Recording (SSR) starts and stops recording on modulation. Mechanical and electronic lock during recording avoids accidental disruption. Internal Flash Memory. A solid state, reliable and non-removable storage medium provides storage capacity for several hours if need be. Although the two standard versions come with either 128Mb and 256Mb, you may specify internal storage of up to 2Gb to special order, if required. A PC-Card slot on the left hand side of the Easycorder means you can add removable flash cards of up to 2Gb each. Optional real time ISDN communication is possible with playback capability using real time audio conversion. File transfer via ISDN, modem & GSM. Graphical representation of audio is clearly shown on the Easycorder’s large LCD. Simple non-destructive cut, copy, paste and insert editing is possible based on markers placed during recording or playback. Undo and Redo functionality is provided. Compatible with all major broadcast automation systems. Marker information and BWF header information fields are available in DAVID, Netia, Dalet, CoStar and many others. Compatible with almost all common ISDN codecs including Telos, CCS, Re, AEQ and many others. Charge time: 2 hours max.